Implementation science is a new and growing field concerned with the transfer of research findings and medical evidence into routine health care. The core of implementation science is the study of clinical quality improvement strategies, addressing not only the content of clinical care — prevention, diagnostics, therapeutics — but also the organization and workings of the care delivery system. This is the province of Vanderbilt’s new Center for Clinical Quality and Implementation Research. Housed within the Center for Health Services Research in the Institute for Medicine and Public Health, the new center will conduct research and assist Vanderbilt teams with the design, implementation and evaluation of clinical quality and safety initiatives. As the center gathers faculty and professional staff, teams from across the Medical Center will increasingly participate in the scientific study of clinical improvement projects, from inception to peer-reviewed publication. “Our mission is to advance research on the quality, safety and delivery of health care,” said the center’s director, Sunil Kripalani, M.D., MSc, associate professor of Medicine. Experts at the center will also initiate grant-funded research projects of their own, and help interested investigators with grant proposals. 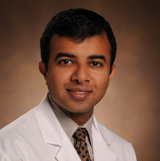 “Within our division, Dr. Kripalani has established a research portfolio focused on implementation science. I am pleased to see him assume this institutional role, which allows us to scale these research efforts to Vanderbilt and beyond,” said Tom Elasy, M.D., MPH, director of the Division of General Internal Medicine and Public Health. The center will also sponsor an implementation science research forum open to faculty, staff and students, and a research support core will be developed for VUMC groups that may want to engage dedicated services from the center. “We’re very pleased to welcome Dr. Kripalani to this expanded role,” said Russell Rothman, M.D., MPP, director of the Center for Health Services Research. Start-up funds for the center come from the Institute for Medicine and Public Health, led by Robert Dittus, M.D., MPH, senior associate dean for Population Health Sciences. “We look forward to contributions from Dr. Kripalani’s team and their future partners from across our clinical enterprise,” Dittus said. A number of Vanderbilt quality improvement projects have appeared in research journals, but, “for every one that’s been published, 50 more may have occurred. We’d like to help share more of the excellent work that’s being done here,” Kripalani said.